Garstang assistant boss Mark Thornley is dusting off his gloves and preparing to start in goal against Euxton Villa on Saturday. Garstang No.1 Dan Curwen was sent off against Longridge Town last month and is suspended for Saturday’s home clash at the Riverside. So experienced keeper Thornley is set to get his first taste of match action this season, if the game is on. Garstang boss Neil Crossley says the 50-year-old still trains with the first team and will slot back in with ease. He said: “Our goalkeeper Dan is suspended after he got sent off against Longridge. “It means my assistant manager Mark Thornley will be in goal. “His last competitive game was at the end of last season when he filled in for one game. Garstang have had a frustrating winter full of postponed matches and last weekend’s Richardson Cup clash against Blackpool Wren Rovers also succumbed to the weather. Crossley says his men are chomping at the bit and ready for action. 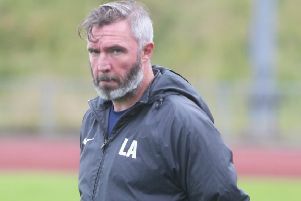 The Riversiders have slipped to seventh in the West Lancashire League Premier Division table without kicking a ball and he hopes the game against fourth-placed Villa beats the weather. He said: “The majority of games are called off on a Saturday morning which means it is too late to arrange a friendly game and get some proper match action. “It is frustrating, everyone just wants to play but it is out of our hands. “Unfortunately you can’t beat the elements. “Euxton are a good side.